This handbook provides basic information on the rights of workers in New York State, sources for more in-depth information and assistance, and suggestions for how you can best voice your concerns and assert your rights in the workplace. The information is based on both state and federal law, and is current as of January 2015. 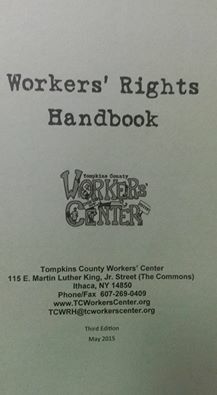 Feel free to contact our Workers Rights Hotline at 607-269-0409 or email TCWRH@tcworkerscenter.org for assistance!